We had such fun hosting my daughter's birthday princess tea party that I'm thinking of hosting another one again sometime soon. Currently TwitterMoms is holding a blogging program for a Fancy Nancy Tea Party. They are kicking off their new TwitterMoms Reading Channel. I'm looking forward to seeing all the book related posts in this new channel, and I'm especially excited about this Fancy Nancy tour. If you've been reading my blog, you know that my daughter is a huge Fancy Nancy fan. And I know exactly where to turn for some great ideas for a tea party. One of my favorite bloggers Christianne at Little Page Turners hosted a Fancy Nancy party earlier this year and posted a ton of great ideas. First of all we'd definitely read one of the Fancy Nancy books. Attire is important. Invite the attendees to wear their fanciest outfit. 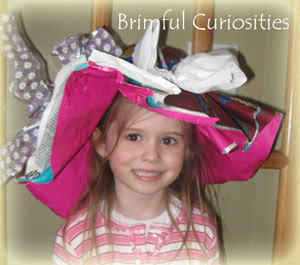 All the girls loved making wrapping paper high-tea hats at our last party. A newspaper version and more detailed directions can be found at maya*made. I love Christianne's idea of having a fashion show and taking the girls' pictures. (Boas are of course a necessity). I also think it would be fun to invite the high school French teacher here to teach the girls a few new words. The Fancy Nancy Website by HarperCollins has several printables online for use at the party, too. What kind of activities do you think would be fun at a Fancy Nancy tea party? What is your favorite Fancy Nancy book? What an adorable and fun party idea! I must keep this in mind for my daughter's b-day next year! :D It's a nice departure from princesses. This sounds like a great idea! I'm definitley going to have to check into it. Thanks for sharing! I've never heard of Fancy Nancy - I'll have to look out for it. I do so love the hats the kids made for the party. I'm glad you showed it again to remind me. We just started a Bulletin Board feature at Winning Readings, and Mondays are Winning Kids days. We'd love to have you link up any of your kids' book-related posts there!